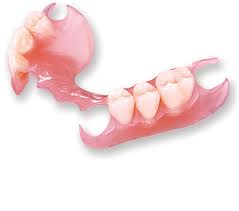 Dental clasp-less partials offer the most aesthetic options among all partial dentures. It receive support by sitting on the remaining ridges after teeth extractions. Dental partials get their retention by being attached to something. It can be attached to teeth, remaining roots, or implants. Unlike conventional partial dentures that attach to remaining teeth by metal clasps, the clasp-less kind use precision or semi-precision attachments to allow it to snap alongside a remaining tooth. The mechanical attachment can actually be hidden on the underside. This technique almost always requires a crown on the tooth receiving the attachment and works best when a crown is already warranted. If you’ve turned away from this option because of the metal clasps…. If you have this and do not like seeing the metal clasps…..
Come in and discuss the available options to improve your smile! Contact the North Dallas Denture Center today to schedule a consultation with Dr. Jason Roe to learn more about full mouth dentures.